Hi Piggy friends, have you missed me? I know I’ve missed you. I’ve been off the radar lately and took a hiatus from my Piggy duties to focus on my #1… my Family. It’s been a roller coaster month of loss and heartache, but also of love and fond trips down memory lane. You see, I come from a long line of piggys whose favorite pastime is busily whipping things up in the kitchen, and it all comes out of love. I dare say that the food we create may be the thing that some of us (especially my Grandma) are most fondly known for. I’m so fortunate to have learned how to cook with my family throughout my life, even when I wasn’t tall enough to reach the kitchen counter. As a child, I remember my dear Grandma would take over the kitchen and make big batches of wontons or dumplings at a time. I have memories of Grandma teaching me how to make these lovely specialties. Our hands would be dusted with flour, egg wash and meat filling. I was always amazed at how quickly and effortlessly Grandma’s fingers moved, folding and pinching the dumplings and wontons closed in such a beautiful way. I was never able to recreate her perfect pleating, but her face always lit up in approval anyway and she would hand me another dumpling to work on. Slowly but surely, we would fill up tray after tray of dumplings. As they steamed, the kitchen would brim with a savory smell that left you hanging on each minute until they were done. My favorite dumplings are a mixture of pork and shrimp. Below is how I made mine, with input from my Dad. The toughest part was chopping all the ingredients, it took me a long time. Once all the prep work was done, I was left standing in my kitchen confused and clueless about what to do with all these dumpling parts. But then I thought back to my younger years when I sat with Grandma making dumplings and it all came back to me. Wrapping and pleating the dumplings is fun and it went by pretty quickly once I got my rhythm going. Snap the stems off the dried mushrooms, if possible. Rinse the dried mushrooms and get the dirt off. Rehydrate the mushrooms by soaking them in hot water for 30 minutes. Once soft, remove from the water and squeeze excess water off. Finely chop. Mix together ground pork, shrimp, napa cabbage, chives and mushrooms until well combined. Add white pepper, light soy sauce, sesame oil and Shaoxing rice wine. 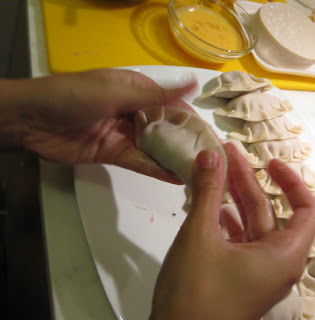 Using a teaspoon, scoop a heaping spoonful of the filling and place it in the middle of a dumpling skin. Dip your finger in the egg wash and paint the top half of the dumpling skin edge. 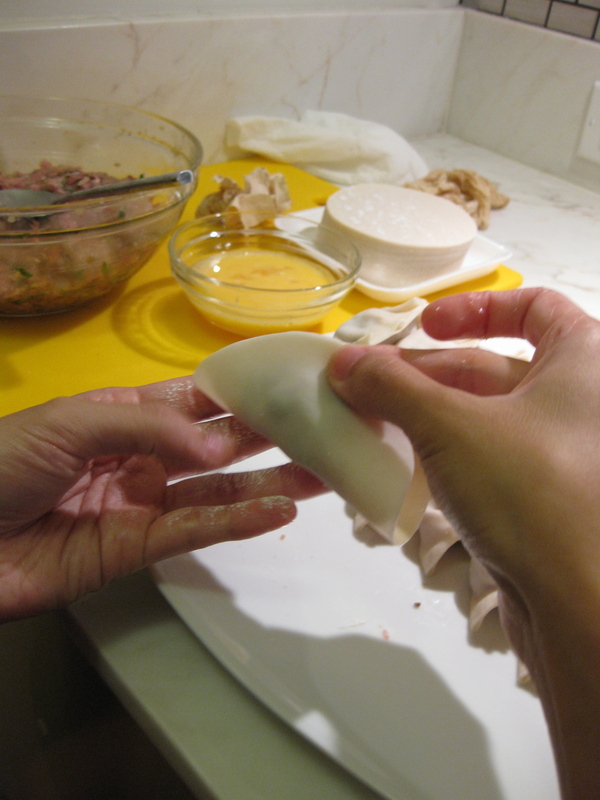 Fold the center of the bottom half of the dumpling skin up to the top. Lightly pinch to seal. Pleat and seal the rest of the dumpling. Bring a pot of water to a boil. Place the dumplings into the pot, stir gently to ensure dumplings do not stick. Once water comes to the boil again, turn the heat down and simmer uncovered for 6 minutes.